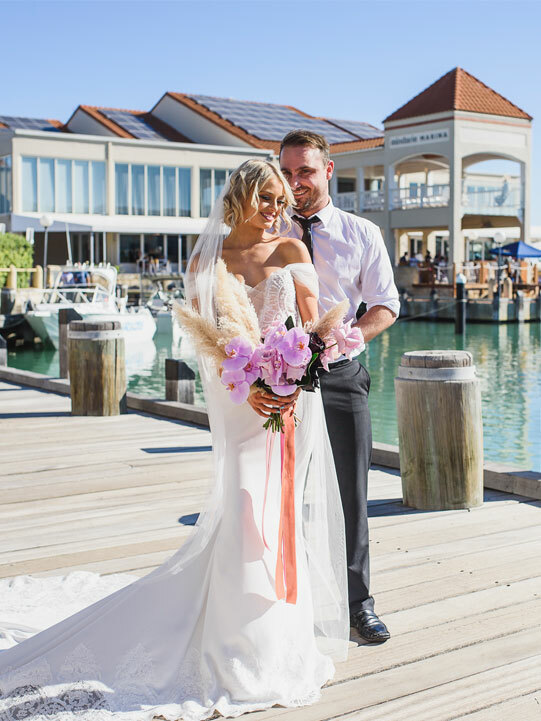 Choosing a venue for your nuptials can be difficult, so Annie Slevison speaks with Amie Harvey from The Pavilion at The Marina Mindarie about what to ask a wedding coordinator before locking in your dream location. With more than 15 years’ experience in the industry, Harvey has helped many couples bring their dream weddings to life. Having built long-lasting relationships with both her clients and suppliers, she knows the conversations that every couple and wedding coordinator should be having. “Planning a wedding can be stressful, [however we] can assist couples in planning and coordination to ensure their wedding is everything they’ve ever hoped for,” she says. Deciding on what type of wedding venue you want can be challenging. However, Harvey suggests narrowing it down to three simple components. “[It’s important to consider] location, budget, and [whether] your venue accommodates the needs of your guests,” she says. Remember to take into consideration other aspects such as wheelchair access, should these be needed. Another tip from Harvey is to look at online reviews of the venue to see what previous couples have had to say. The style of your wedding is a very personal choice that should reflect you and your partner’s unique personalities. Harvey says that while wedding styles differ slightly, many couples opt for a common, well-known theme. Therefore, most wedding coordinators are able to offer advice on how to obtain the look you and your partner are aiming for. Many venues also offer the chance to work with outsourced suppliers, should you require a specific product or service. Harvey notes that The Pavilion at The Marina Mindarie is able to recommend some fantastic local vendors that can help create your dream wedding. It is also important to find out if the venue has certain style guidelines you must adhere to. Before you decide on a colour palette or where the floral arrangements will be placed, be sure to consult with your wedding coordinator about any restrictions. Harvey says The Pavilion at The Marina Mindarie is a neutral venue that can be decorated to suit all wedding themes, and its views over the marina will surely complement any décor or colour choices. Most wedding venues will offer custom-designed packages, however it is essential to check this with your wedding coordinator prior to booking. Selecting a package that suits you and your partner is vital to ensure your big day runs smoothly. Harvey says the team at The Pavilion at The Marina Mindarie understand the importance of this and will carefully plan the wedding based on your desires. “As no two weddings are the same, we [tailor] our packages to meet the individual needs of our couples,” she says. An important element in your wedding package is the menu. Finding out if the venue has an in-house caterer or off-site culinary team will aid in determining whether you are able to try the food beforehand. “[The Pavilion at The Marina Mindarie] also offers a complimentary menu tasting [to ensure] the menu is exactly to your taste,” Harvey says. If you find yourself falling in love with a wedding venue, be sure to ask as many questions as possible. Asking if the venue has noise restrictions will give you peace of mind when you and your guests are belting out your favourite Beyoncé tunes on the dance floor. Similarly, if you’d like to involve your furry friend in the celebrations, make sure you check with the venue beforehand. Pet-friendly weddings are becoming increasingly popular, and more venues, such as The Pavilion at The Marina Mindarie, are catering to these requests. “We love all family members… right down to the four-legged ones,” Harvey says. Before locking in a space, ensure you communicate the vision you have for your big day with the venue’s wedding coordinator. This will make it much easier for the venue’s events, catering and styling teams to bring your dream wedding to life, so all you have to worry about is celebrating with your nearest and dearest.